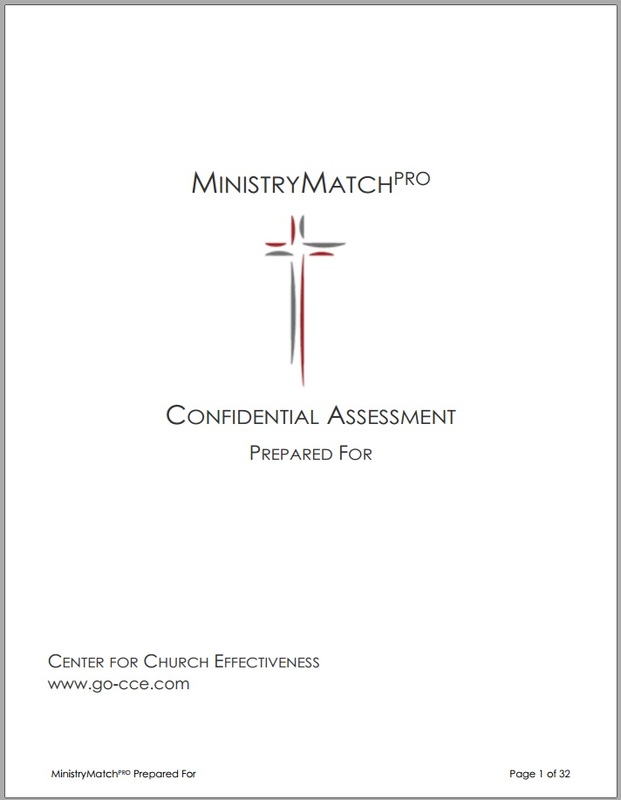 What exactly are the MinistryMatch Assessments? The MinistryMatch Assessment is a multiple-construct tool developed to measure the elements of an individual's life that are directly related to Christian ministry. The MinistryMatch was originally developed by Bob Gilliam, a church consultant, and Steve Johnson, a professional Christian vocational assessment counselor, in the mid 1980's. Gilliam had previously started the church consulting ministry for Denver Seminary and was in charge of placement for the Evangelical Free Church of America. He needed tools to assess pastors and church staff. Measured only one or a few of the needed constructs. Were worded for secular vocation, and not for ministry. Included negative elements of constructs, so Jesus after whom we are to model, could not answer these. Measured psychological pathology, not ministry issues. Were not normed for church staff. It measures seven different constructs including temperament, motivated role, leadership style, participation style, ministry gifts, and ministry values. Ninety-nine elements are measured within these seven constructs. Thus, virtually every issue important to ministry is measured in one assesment. 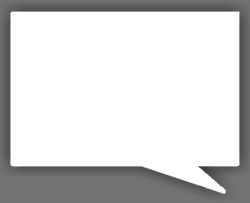 The questions in MinistryMatchPro are worded to fit ministry settings. The wording for MinistryMatchLaity questions is adjusted to fit the general population who may be administrative staff, board members or other volunteers. Questions measure only positive issues, those that are a part of the image and character of Christ. MinistryMatchPro is normed for "staff members" in Christian churches and Christian ministries (para-church, seminary, denominations, etc.). Some constructs and elements are added that are important to ministry but not included in other tests. Many elements mixed together and invisible in other tests are unbundled and explicit in the MinistryMatch. 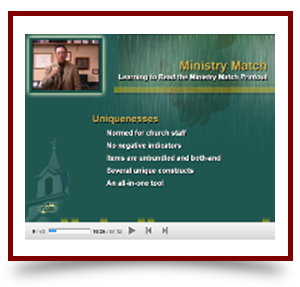 As a result, MinistryMatch is one of the most widely used tools to evaluate and place persons in ministry, both for placement of professional staff in churches and organizations as well as recruitment and placement of lay leaders inside their own churches. 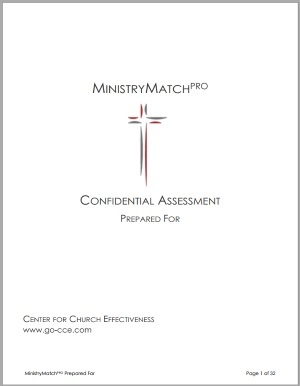 What does the MinistryMatch Assessment measure? The MinistryMatch Assessment measures six major constructs that are vital to effective ministry. Temperament (sometimes called personality) - Sixteen independent elements are measured and normed. Motivated Role - This construct measures five elements to discover what part of the development process a person is most motivated toward. Leadership Style (sometimes called Impact Style) - This construct is similar to the DiSC behavioral profile and assesses how individuals usually impact others. Participation Style - This unique construct measures how persons will interact as members of a decision-making group. Functional Spiritual Gifts - Spiritual gifts are included and many are unbundled for greater specificity. For example, "teaching" is unbundled as preaching, teaching, discipling/mentoring, and interpersonal communication. Ministry Values - This construct allows the participant to prioritize his/her ministry values from strong values to anti-values. Age Group - This construct allows especially lay leaders in churches to designate what age group(s) they minister to with the most fruit and fulfillment. Why use the MinistryMatch Assessment? God has a specific plan for every believer - Eph. 2:10. God made everything about us to enable us to accomplish His will - Psalm 139. In this context, you are like a tool, and the best way to discover the purpose of a tool is to see what it does best. Based on this, the MinistryMatch Assessments can help a Christian discover God's will for his/her life and lead him/her to accomplish God's will with the greatest effectiveness. Equips consultants to assess and coach ministry staff. Enables pastors of assimilation to help lay leaders find satisfying ministries. Enables denominational executives to place ministry candidates where they will be fulfilled and fruitful. Helps individuals to better know themselves. Does all this without file drawers full of paperwork. How do I to take theMinistryMatch Assessment? The MinistryMatch Assessment is taken online via the Internet. The assessment is very simple. For each question, you simply enter a number representing your answer. Before you take the MinistryMatch Assessment, you must first purchase a license. If you are an individual, you may purchase MinistryMatch and begin answering the questions immediately following the instructions provided. If you are an organization, you may purchase multiple license codes which you may then provide to individuals within your organization by making that selection in the Purchases section. Note: On the average, completing the MinistryMatch Assessment will take about two and a half hours. It is ideal to finish in one sitting with a few short breaks. However, you may stop any time you like and return later to continue your work. How reliable are the MinistryMatch Assessments? Reliability and validity studies have been completed on a database of thousands of staff profiles. Scattered all across the United States, these staff personnel were primarily from EFCA, Bible, and Independent Evangelical Churches. Coefficient Alpha was used to evaluate each construct, and Pearson´s Rho was used to measure each element. We are well aware that different denominations have distinctive MinistryMatch Assessment profiles. If you would like more information about the statistical background of the MinistryMatch Assessment, please To learn more, please Contact Us. The questions in MinistryMatchPro are worded to fit ministry settings. For instance, you will answer questions like, "Do you feel more fulfilled preaching to a congregation of 100 or teaching an interactive Sunday school class of 100?" Such questions are easier to identify with, easier to answer and have more direct application to those in ministry. The wording of the questions for MinistryMatchLaity is adjusted to fit the general population who may be administrative staff, board members or other volunteers. For instance, while still asking questions that involve a church setting, we do not ask those that most laity would not do, such as studying Greek or preparing a series of sermons. Discover the ministry abilities of professional staff members - pastors, associates, worship leaders, seminary and denominational staff. Help them to assess their "fit" in ministry. Help them retro-fit their position profiles to better fit themselves. Help them understand other staff and work together better. Help candidates and churches match up in placement. Discover the ministry abilities of church members. Help regular members assess ministry abilities and find the "best fit" for ministry in a church. Help assimilation pastors find the best persons to work in specific ministries. Both measure the same traits. Both have the same number of questions. The definitions of traits are identical. The printout report looks identical. Question wording is different for each tool. Norms are different for each tool. The price is different for each tool. What is the output of the MinistryMatch Assessments? 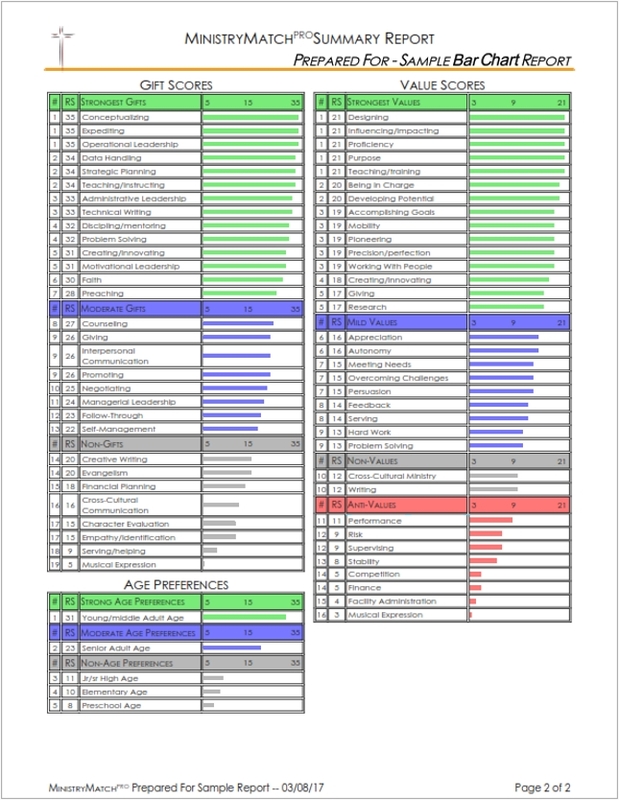 The MinistryMatch Assessment produces two types of reports, a comprehensive 33 page Detailed Report and three Summary Reports. The Detailed Report is primarily intended for use by the individual and provides a personalized interpretation of an individual’s scoring in all seven MinistryMatch constructs. The Summary Report is intended for those already familiar with the MinistryMatch results, to be used in comparing the characteristics of multiple individuals. 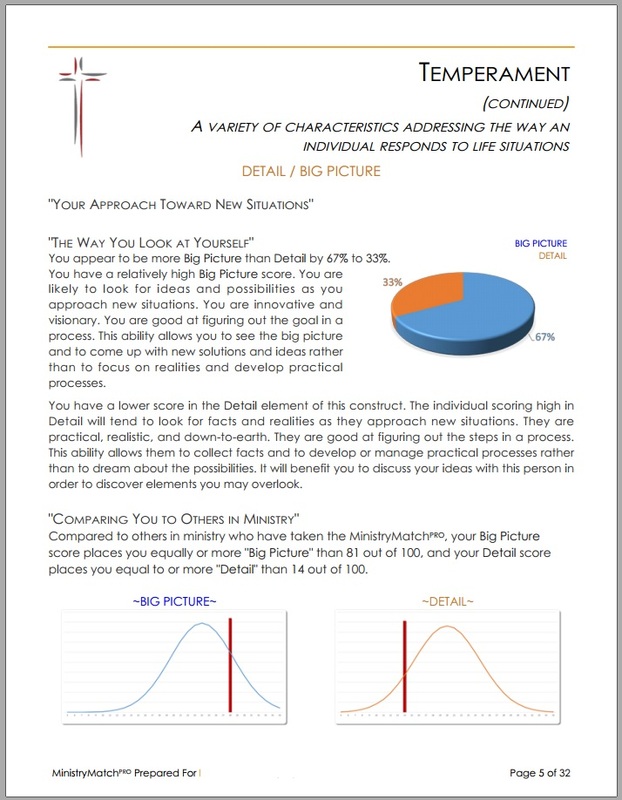 The Detailed Report gives a personalized assessment an individual’s abilities that are important in ministry. It reports on the measurement of certain aspects of temperament, motivated role, leadership style, participation style, functional gifts, and values. The first four constructs relate to characteristics of one’s approach to ministry while the last three constructs assess a person’s gifts or abilities, values and rporting accuracy. 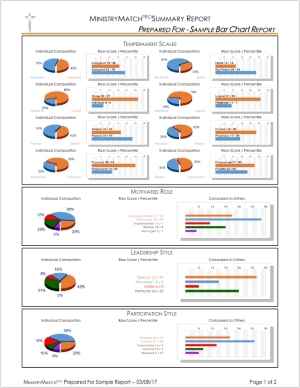 Click Here to View a Complete Sample Report. 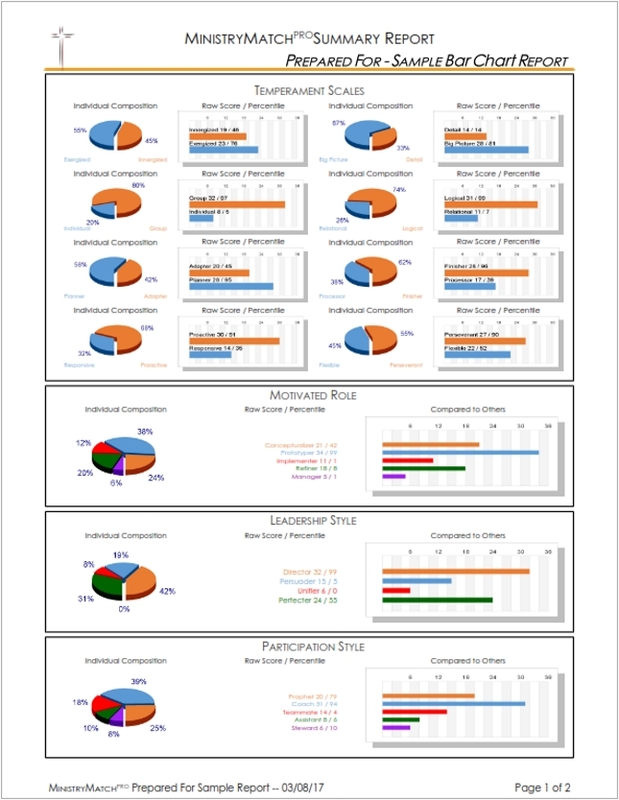 The first page of the Summary Reports graphically describes the first four constructs. The second page reports on the last 3 constructs in a prioritized list. How do Churches Use the MinistryMatch Assessments? Many thousands of churches across America and the world are using the MinistryMatch Assessment to significantly enhance their ministry. Many churches use MinistryMatchPro and a brief consultation to tune up and retro-fit ministry positions to better fit their staff. Many use the MinistryMatch Assessments with their church staff and board to build stronger teams and manage conflict. Churches use the MinistryMatch Assessment in the staff search process to ensure that they find and place the right person in the right place at the right time. But the greatest use of the MinistryMatch Assessment in churches is for the internal selection of lay ministry workers. The church first has each of the individuals on their board and committees complete the MinistryMatchLaity. Finally over a period of one to two years, they request that every attender complete theMinistryMatchLaity Survey. At the same time, staff members define profiles for ministry positions within the church within MinistryMatchConnect. Now, by using MinistryMatchConnect to match attenders to positions, the church is set to experience a new level of effective recruitment never before known! Who else can use the MinistryMatch Assessment? Effective placement is one of the five top responsibilities of any denomination. Doing this well today involves collecting the right information, making that information available quickly and easily to the right persons, and providing a solid and comprehensive process to evaluate that information and form godly conclusions. The MinistryMatch suite of apps provides a comprehensive placement process and tools for denominations. Some denominations have their own placement process, but use MinistryMatchPro as part of their own process. To learn more, please Contact Us. Seminaries have the same placement needs as denominations. Special student prices are available for seminaries using MinistryMatch products and processes. To learn more, please Contact Us. Para-church organizations like "The Navigators," and others use MinistryMatch for internal position profile retrofitting as well as for team building and external consulting. To learn more, please Contact Us. MinistryMatchConnect has been designed to assist churches and organizations in the utilization of MinistryMatch assessment results to improve choices and save time in matching leaders with ministries that fit the way God created those individuals. It provides a simple but powerful way to manage data and match individuals and ministry positions with the touch of a button. Your church, denomination, or organization can access the results for each person that has either taken MinistryMatch from within your ministry or has granted you access to their results. There is no limit to the number of individuals that can be included. MinistryMatchConnect builds upon the MinistryMatch Assessment to provide a powerful placement and team-building tool for ministries looking to increase the effectiveness and fulfillment of the people within their organization. MinistryMatchConnect allows you to define the ideal temperament, motivated role, leadership style, participation style, gifts, values and age focus of a desired ministry position. It then compares this ministry position profile to each person you select from those assessments available to your organization, and gives you a list of those individuals ranked in a "best-fit" ranked order for the ministry position. Conversely, MinistryMatchConnect allows you to select an individual and compare their MinistryMatch to the ministries in your organization, ranked in a "best-fit" order for that individual. MinistryMatch Profiles of selected personnel, staff, and/or candidates to be matched to positions. A database of positions (jobs) is created by you to explicitly describe ministry positions which are to be matched to selected individuals. Finally, MinistryMatchConnect lists in a ranked order either the best persons for a ministry or the best ministry fits for an individual. Its just that simple. What is the purpose of the MinistryMatchConnect Training Video? The Training Video is currently being reproduced, and is therefore temporally unavailable. This MinistryMatchConnect Training Video is a video and slide presentation that trains you on the interpretation and use of MinistryMatchConnect. 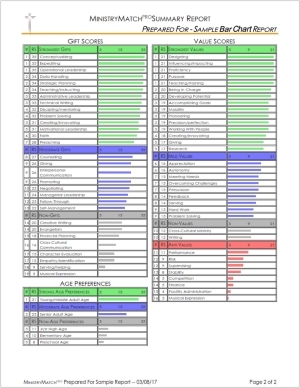 It also provides a thorough understanding of the MinistryMatch Assessment results. The Biblical basis for the MinistryMatch Assessment. How to interpret raw scores and norms. What is the Church Effectiveness Survey? The Church Effectiveness Survey provides a detailed picture of a church's demographics, spiritual makeup, andperceived and actual effectiveness as a disciple making entity. One of the major responsibilities of Church leaders and staff is to shepherd the flock. The Bible tells us that "The Good Shepherd knows His sheep." The Church Effectiveness Survey provides the tools for you to do this effectively. To give an accurate picture of the congregation (The Good Shepherd knows His sheep). To understand the congregations preferences in ministry. To provide accurate information to evaluate any needed improvements or adjustments in ministry. The survey consists of 120 predefined questions. You may add up to 50 additional questions of your own. The results of the survey is cross-tabulated. It contains 44 cross-tabulation categories for each of the questions plus a category for every Sunday school class and small group in your church. 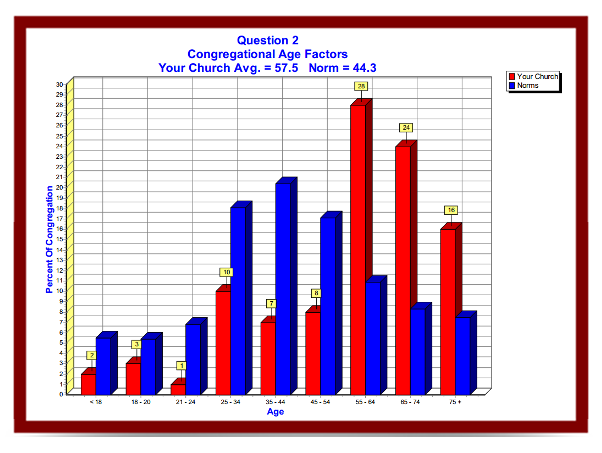 The results report gives you an incredible detailed view of your congregation. How does one take the MinistryMatch Assessment? Before you take the MinistryMatch Assessment, you must first have a license. If you are an individual, you will either purchase a license or be provided a license by an organization, and take the MinistryMatch Assessment immediately, following the instructions provided. Note: On average, the MinistryMatch Assessment will take about two and a half hours to complete. It is ideal to finish in one sitting with a few short breaks. However, you may stop any time you like and return later to continue your work.